The European elm flea weevil (EEFW) (Orchestes alni) [order Coleoptera: family Curculionidae] is a new foliage-eating beetle of elms in Ohio. The adults feed on leaves, producing circular, window-paned holes in the leaves. Larvae feed as leafminers. The primary significance of this new defoliator is the reduction in the aesthetic value of elms as landscape and streetscape trees. Management of the elm flea weevil, if desired, requires the use of either a foliar or systemic insecticide application. EEFW utilizes a wide range of elms (Ulmus) that include American, Asian and European species and elm hybrids; however, its most favored hosts appear to be Siberian elm (U. pumila) and smoothleaf elm (U. carpinifolia). Many of the new elm hybrids that include Siberian elm as one of the parent species, such as Homestead elm are also a favored host (Condra et al. 2010, Miller 2014). American elm species can support the life cycle of EEFW, but appear to be less desirable especially when Siberian elm is available. Surprisingly, the true Chinese elm (U. parvifolia), which tends to be resistant to other defoliators such as elm leaf beetle and Japanese beetle, is fed upon by adult EEFW and supports larval growth and development. Adult EEFWs feed on the leaves of its host trees producing irregularly shaped, incomplete holes through the leaves. The flea weevils typically feed from the undersides of the leaves chewing through the lower leaf surface, consuming the middle leaf tissues and leaving the upper leaf surface intact, resulting in a “window pane” effect. As the remaining leaf surface tissue dries, it may tear and fall out leaving a complete hole through the leaf. Adult feeding occurs twice during the growing season. The first feeding occurs as the new foliage of the year begins to emerge from the buds and expand as seen in Figure 1. The second and longer feeding occurs after the new adults emerge in early summer and continues through the growing season as seen in Figure 2. EEFW larvae are leafminers and following egg hatch, the EEFW larva create a snake-like mine toward the leaf margin. When the larva reaches the leaf margin, the mine expands into a blotch mine as shown in Figure 2. The mines interfere with the normal expansion of the leaves causing distorted leaf shapes. 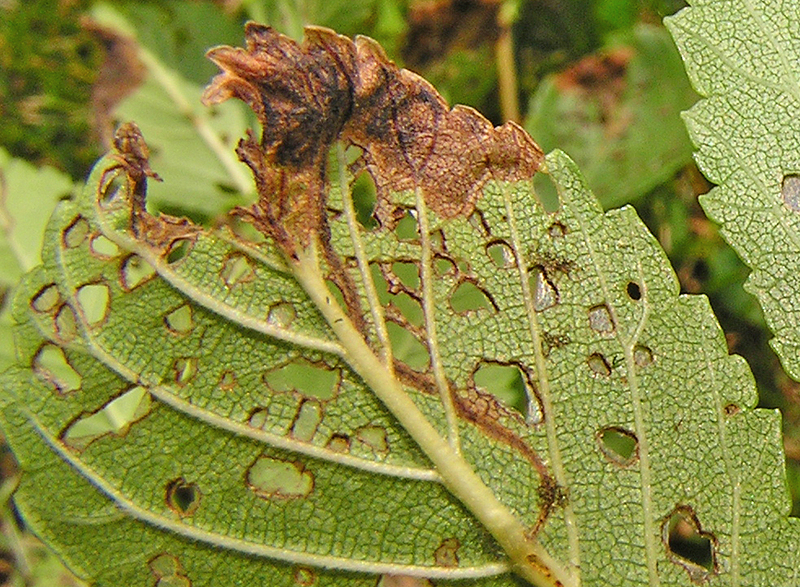 The leaf tissues forming the mine will dry, tear and crumble producing a tattered appearance. The two feeding episodes plus the leaf mining cause extensive damage to the foliage, reducing the aesthetic appearance of the host tree. Figure 1. Early spring feeding by overwintered European Elm Flea Weevil adults. Photo by Curtis E. Young, Ohio State University Extension. Figure 2. European Elm Flea Weevil adult feeding (holes and window paning) egg laying pits in mid-rib vein, and larval leafmining (snake-like mines and late blotch at leaf margin). Photo by Curtis E. Young, Ohio State University Extension. EEFW is a small (1/16" in length), mostly reddish-brown beetle with a black head and snout, and has black markings or spots on its wing covers as shown in Figure 3. The snout identifies the beetle as a weevil. Like the true flea beetles (family Chrysomelidae), EEFW has thick, enlarged femurs on the hind pair of legs which are used for jumping when disturbed. The flea weevil can also fly after taking off by jumping. EEFW overwinters as an adult weevil on or near the host tree. In March or April, the adults become active and move toward the leaf buds and newly expanding leaves. As soon as new leaves are exposed, EEFW begins to feed. Mating occurs in the spring and mated EEFW females chew a pit into the mid-rib veins of the leaves to deposit an egg. Sometimes a female will also use a side vein for egg laying. Excessive pit chewing may kill portions of the leaf even before leafmining begins. Depending on temperatures, the egg will hatch in about a week. EEFW larvae are legless, pale-yellow to yellow grubs with dark-brown head capsules and mandibles as shown in Figure 4. EEFW larvae remain in the leaf mines for their entire development. Mature larvae spin a roughly round cocoon of silk inside of the blotch mine in which to pupate. EEFW pupae are also initially yellow in coloration. In a week to 10 days, new adult EEFW will emerge from the mines and will feed through the rest of the season, eventually disappearing into overwintering sites on or near the host tree. There is one generation of EEFW each year. Control of EEFW is complicated by the sizes of trees that may need protection. Homeowners and even some professional applicators will not have the equipment to apply foliar sprays to large trees. Systemic applications are more functional on larger trees. One application of a systemic insecticide should provide season long control of this insect. Products would need to be applied fairly early in the spring to limit the feeding by the overwintered adults and/or to prevent leaf mining by the larvae. If non-systemic foliar sprays are used, repeat applications might be needed to protect against migration of new adults from untreated to treated trees later in the summer. Be sure to completely read, thoroughly understand, and follow the label directions on any pesticide to be used to manage EEFW. Contact your local Extension office for current, recommended products. Figure 3. European Elm Flea Weevil adults (note enlarged hind leg femurs). Photo by Curtis E. Young, Ohio State University Extension. Figure 4. European Elm Flea Weevil larva (lower left hand corner) and pupae extracted from leafmines and cocoons. Photo by Curtis E. Young, Ohio State University Extension. EEFW is native to Europe. The exact year EEFW was introduced into the United States and where is unknown; however, it was first reported to be causing notable damage to elm trees in 2003 in Dekalb County, Illinois (Anderson et al. 2007). Based on the amount of damage observed, the number of weevils present and its distribution in 2003, EEFW had most likely been in the United States for a number of years before its discovery in 2003. Extensive research was being conducted on elms at The Ohio State University, Columbus, and at the USDA Forest Service, Northeastern Research Station, Delaware, Ohio, in the 1980s and early 1990s and EEFW was not observed on the elms at that time. The primary defoliator of elms at that time was the elm leaf beetle (ELB) (Xanthogalleruca luteola). EEFW was first reported in Ohio in 2007 (Young, 2007) and infestations were already quite extensive and widely distributed in Ohio. EEFW is now found throughout Ohio. Since 2003, EEFW appears to have undergone a rapid range expansion with reported detection across the United States from New Jersey to Oregon (Looney et al. 2012). It appears to have replaced ELB as the primary defoliator of several species of elms and elm hybrids after ELB’s decline in the 1990s. Anderson, R., C. O’Brien, G. Salsbury, and S. Krauth. 2007. Orchestes alni (L.) Newly Discovered in North America (Coleoptera: Curculionidae). Journal of the Kansas Entomological Society. 80: 78-79. Condra, J., C. Brady, and D. Potter. 2010. Resistance of Landscape-Suitable Elms for Japanese Beetle, Gall Aphids, and Leaf Miners, with Notes on Life History of Orchestes alni and Agromyza aristata in Kentucky. Arboriculture & Urban Forestry. 36(3): 101-109. Looney, C., L. Humble, and W. Cranshaw. 2012. Orchestes alni (L.) (Coleoptera: Curculionidae): New Records from Western North America with Notes on Parasitoids. The Coleopterists Bulletin. 66(1): 63-66. Miller, F. 2014, December 4, 2013, Illinois Forest Health Highlights. http://www.fs.fed.us/foresthealth/fhm/fhh/fhh_13/IL_FHH_2013.pdf (Accessed on 7-20-2015). Young, C. 2007. Bug Bytes: Is it a flea beetle or is it a weevil? Buckeye Yard and Garden Online. June 7, 2007. Available online at: http://bygl.osu.edu/archive/bygl2007_10.html (Accessed on 7-20-2015). Disclaimer—This publication may contain pesticide recommendations that are subject to change at any time. These recommendations are provided only as a guide. It is always the pesticide applicator’s responsibility, by law, to read and follow all current label directions for the specific pesticide being used. Due to constantly changing labels and product registrations, some of the recommendations given in this writing may no longer be legal by the time you read them. If any information in these recommendations disagrees with the label, the recommendation must be disregarded. No endorsement is intended for products mentioned, nor is criticism meant for products not mentioned. The author and Ohio State University Extension assume no liability resulting from the use of these recommendations.